The French launch company announced Wednesday the signature of a long-anticipated contract for 10 more Vega launchers from Avio, Vega’s prime contractor. 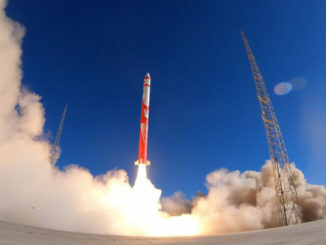 It marks the third order of Vega rockets from the Italian manufacturer, bringing the total number of Vega vehicles purchased to 26. Six of the vehicles ordered by Arianespace will come in the same basic Vega configuration that has successfully launched 10 times since debuting in February 2012. Avio will also build the first four upgraded Vega-C launchers, featuring more powerful rocket motors and an enlarged payload fairing to haul bigger satellites into orbit. Meanwhile, Arianespace is in the final stages of negotiating with its parent company, Ariane Group, to order around 18 more Ariane 5 rockets, the last batch of Ariane 5s to be built after more than 20 years of launches. Arianespace expects to sell the additional Ariane 5 flights to commercial customers and European governments for launches through the early 2020s. 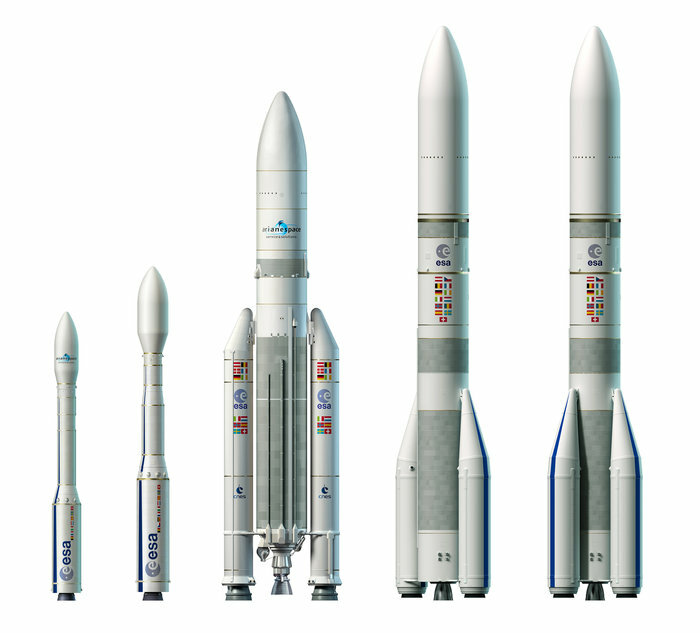 A separate order of new Ariane 6 rockets is also on tap, a milestone that will officially greenlight production and assembly of the first Ariane 6, which is due for its inaugural flight in July 2020, and will eventually replace the Ariane 5 upon its retirement around 2023. The exact number rockets to be manufactured in last set of Ariane 5s, called the “PC” batch, will be determined later, according to Stephane Israel, chairman and CEO of Arianespace. The timing of the switchover from the Ariane 5 to the Ariane 6 will depend on the success of the new launcher’s initial flights, and customer demand. The pending order could give the Ariane 5 more than 125 total flights by the time of its retirement, assuming all the rockets are sold by Arianespace. All 18 rockets from the last Ariane 5 production batch procured by Arianespace in 2013 now have customers for launches through 2020. The new set of Vega rockets to be manufactured by Avio and its partners will begin flying from French Guiana in 2019, the same year of Vega-C’s scheduled debut. Arianespace and Avio signed the contract for new Vega vehicles Wednesday at the 34th French-Italian summit in Lyon, France. French President Emmanuel Macron and Italian Prime Minister Paolo Gentiloni witnessed the signing. “With these 10 additional launchers, Arianespace proudly teams up with its partners to ensure the sustained operation of Vega, along with the service entry of Vega-C as from 2019 at the Guiana Space Center,” said Luce Fabreguettes, Arianespace’s executive vice president of missions, operations and purchasing. “This latest contract confirms the favored relationship built up by Arianespace and ELV/Avio, industrial prime contractor for Vega, for the success of our light launcher, which has rapidly established itself as the standard in its class. “With 10 Vega and Vega-C launches in its order book, Arianespace addresses the growing demand from both government and commercial customers for small satellite launch services, in particular for scientific and Earth observation missions,” Fabreguettes said. The Vega-C will be able to haul up to 4,850 pounds (2,200 kilograms) into a circular polar orbit 435 miles (700 kilometers) above Earth, nearly 50 percent better than the lift capability of the existing Vega design. 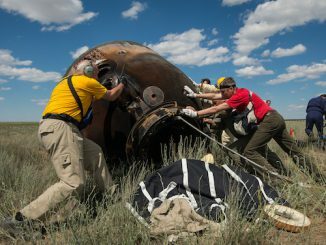 The upgrades will include replacing the Vega’s solid-fueled P80 first stage motor with an enlarged P120 motor. The wider, longer P120 rocket stage will burn 142 metric tons — around 315,000 pounds — of solid powder propellant, compared to 88 metric tons — around 194,000 pounds — of fuel packed into the P80 motor. The Vega-C’s first stage will burn longer than the Vega’s existing P80 motor, and produce about a million pounds of thrust, an increase from the nearly 700,000 pounds of thrust generated during current Vega liftoffs. 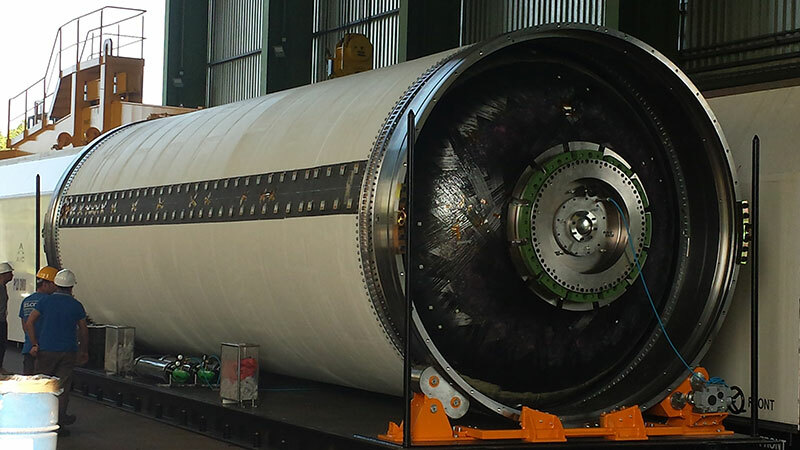 The P120 motor will also help power the Ariane 6 rocket, which will use two or four strap-on boosters derived from the Vega-C rocket mounted around its liquid-fueled core stage. Officials say sharing the P120 rocket motor between the two launchers will help cut costs. The first ground firing of a P120 motor is scheduled for next year on a test stand in French Guiana. The Ariane 6 and Vega-C programs are being developed through public-private partnership, cost-sharing arrangements by Ariane Group, Avio, the European Space Agency, and individual ESA member states. Avio also developing a bigger second stage for Vega-C called the Zefiro 40, which will take the place of the Zefiro 23 second stage currently flying on Vega. The Vega-C will use the same Zefiro 9 third stage already in service on Vega, and the hydrazine-fueled fourth stage, or AVUM, will have a lighter structure and carry additional propellant, further enhancing Vega-C’s payload capacity. The Swiss company Ruag is also designing a wider payload shroud for the top of the Vega-C rocket, allowing it to haul up bigger spacecraft or clusters of small satellites on the same mission. Other innovations on the Vega-C include new avionics and navigation systems, and the Vega-C rocket will be the first European launcher to be equipped for tracking and telemetry relay through NASA’s TDRS satellite network, reducing reliance on costly ground stations. Arianespace has already signed customers for three of the early Vega-C rocket flights. Two Vega-Cs will launch pairs of high-resolution commercial Earth observation satellites for Airbus Defense and Space beginning in mid-2020. The Italian Ministry of Defense and ASI, the Italian space agency, have booked one Vega-C and one Soyuz launch from French Guiana to carry two second-generation COSMO-SkyMed radar surveillance satellites to orbit.